One of the biggest challenges that I face writing and posting on Little Prairie Kitchen is creating and sharing recipes that are delicious, have whole and simple ingredients, can be made in a decent amount of time (or made in a larger amount to be reheated later) and are just something fun you want to make and eat. I want to share lots of from scratch, big meals but I know that many of you might not have all the time in the world to cook or love and devote yourself to it as much as I do. But I also live in the real world, where even if you cook as a job, you don’t always have time to have it all homemade all the time. But what items should be on the “always from scratch list” and what can you save time and just purchase at the store? I have a few items that we no longer purchase (pasta sauce I’m looking at you), but there are many items I still purchase without giving it a second thought. And with that idea in mind, I decided to spend some time recipe testing items that I have typically purchased in the past and share my thoughts with you. One of the big challenges of this is finding recipes that while they may take more time, either save you money by being inexpensive to make or have such a superior flavor and taste that I would gladly devote more time and a little more money to eat it. This week, I chose a recipe based on an intense craving for Cheez-Its. In an effort to save a few bucks and use up all the food I have, I did not do a big weekly shop (I made an exception and purchased flour, olive oil, milk, fresh produce, coffee and Red Bull, you know the necessities!) and have been trying to make meals with what I have on hand. Since I could not even try to say a cheese cracker was a necessity and run out to buy some, I turned to my friend the internet to find some cracker recipes that were simple, had ingredients I had on hand, and did not take 8 hours to make. I found one on the AllRecipes website that easily checked off all of these boxes, so I got to work. The recipe was pretty straightforward and easy to follow and the time noted on the recipe (1 hour 20 minutes) was pretty much how long it took for me to make these. 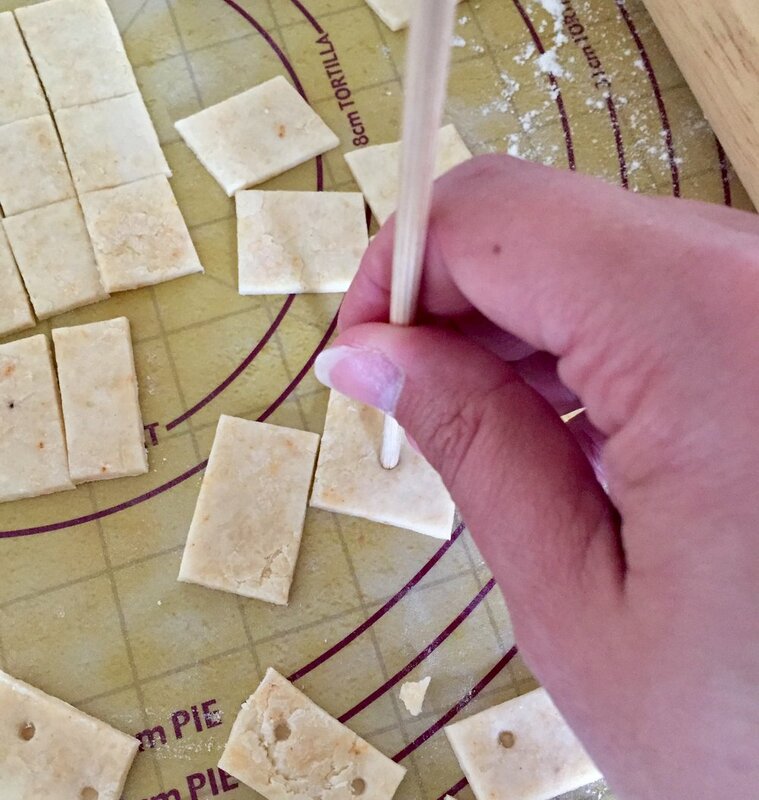 The ingredients were mixed, water was added, a dough ball was formed and chilled, rolled out and cut into squares, poked with the backside of the sticks and baked. What I found challenging was rolling out the dough evenly and keeping the thickness of the crackers the same, which matters quite a bit when baking. I had a nice amount of perfectly puffed crackers that had a good crunch and wonderful flavor, but those that I rolled out too thin were blackened, had a bit of a bitter taste and were too hard. 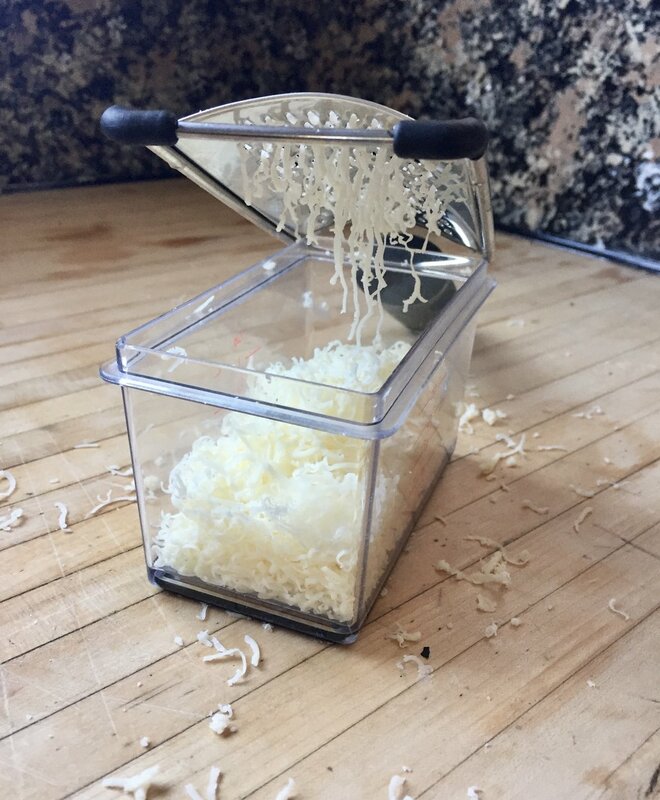 Shredding the cheese by hand was a bit time consuming but the amount (1 cup and 2 tablespoons or so) was manageable and I survived. So am I a homemade cheese cracker convert? Sort of. For me, the taste is superior in the homemade version. The crackers (when rolled correctly!) are flaky, crunchy, cheesy and just a little salty. It is a different flavor than the boxed version, but different in a very good way. There are 7 active ingredients in the homemade version that are fairly straightforward and easy to say. The leading boxed version has 8 main ingredients but include parenthesis after a number of the ingredients that list the sub-ingredients within the ingredient. Some are also somewhat difficult to say (mononitrate anyone?) and are not items that can be easily purchased to make this at home. While I cannot say for sure if any of these ingredients and sub-ingredients are truly bad for us, my rule of thumb is that if I do not know what it is, I should probably go easy on eating it. But for sheer convenience and fulfilling an immediate want or need, the boxed version is clearly the winner. The boxed version can also be stored for weeks before they begin to go stale and the homemade crackers have a shelf life of about 5 days. Now that I know how easy it is to make crackers at home, I will probably be making them more than buying them. That does not mean that sometimes a box will not sneak into my cart and be taken home to enjoy, but for the most part I will stick to the homemade. How about you? What food do you make at home? What food are you wondering about a homemade version of? Drop me a line and let me help you wonder no more!